Fields, roadsides, fencerows, gardens, vacant lots, and other disturbed ground. 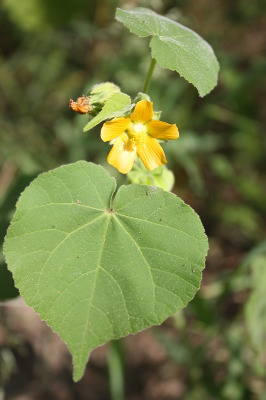 A native of China, introduced into the New World before 1750 as a potential fiber crop but now a common weed of row crops, such as corn and soybeans. First collected in Michigan in 1860 in Washtenaw Co. Frequent in southern Michigan, scarce northwards. The petals are ca. 7–10 mm long, usually yellow-orange. MICHIGAN FLORA ONLINE. A. A. Reznicek, E. G. Voss, & B. S. Walters. February 2011. University of Michigan. Web. April 25, 2019. https://michiganflora.net/species.aspx?id=1666.